I like places that put on a good display at Halloween, if for no other reason than it helps deter the ever increasing numbers of Early Christmas Decorating Birds from putting out their decorations in October. Although the popular annual town-sponsored haunted hayride is no more and becoming a distant memory, the spirit of the season lives on at places like Floral Innovations on Main Street. 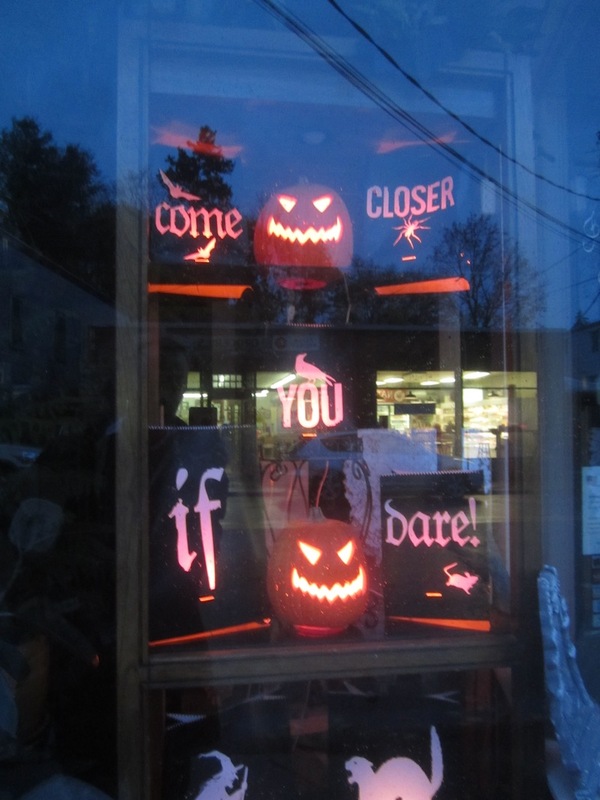 Donna Phelan, the shop’s owner pulls out all the stops when decorating her windows for the season. FLoral Innovations Window Display Though there are several homes in the town that sport elaborate Halloween décor, there is one on Main Street right up from the school that takes top prize in my book. Each year, more and more ghosts, zombies, killer clowns and demonic children congregate along the neatly clipped privet hedge, emerge from the lawn, or hang from the trees in the home’s otherwise benign front yard. On a bright sunny day they seem harmless enough, but at dusk, or when they sway slightly in the wind, they become distinctly less so. I wonder how many young trick or treaters refuse to run this goblin gauntlet, no matter what candy prize awaits at the front door. If indeed one does.